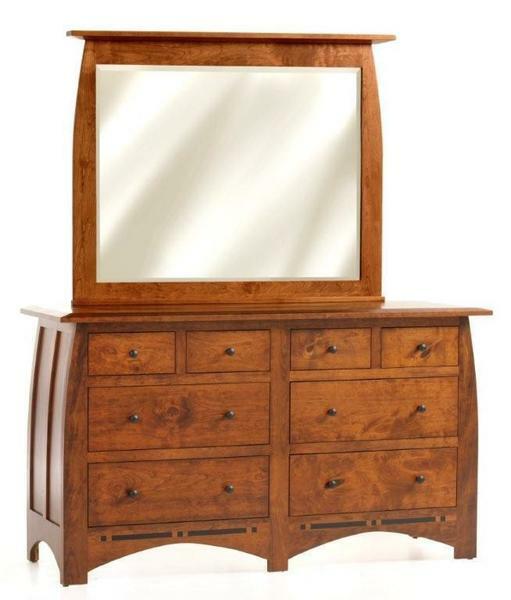 Amish Vineyard Dresser Low 66"
Hand-selected North American hardwood is combined with the masterfully skilled hands of Amish woodworkers to construct a piece of furniture that is simply amazing. Featuring a beveled glass mirror and rich ebony inlays, the Amish Vineyard Low Dresser with add warmth and elegance to any decor. By hand picking the hardwood used for the Miller Bedroom Collection, we can ensure that every piece has unique character and longevity, giving you a wonderfully constructed heirloom that will last generations. This dresser features eight dovetailed drawers that ride on heavy-duty full-extension slides to ensure function and integrity for many years to come. Add the cedar drawer bottoms for that wonderful, natural smell on you clothes and linens, and the soft-close slides to ensure you never slam a dresser drawer again! As a convenient way to include your TV into your bedroom decor, while maintaining that perfect appearance, the optional TV mirror is perfect. Functioning as a normal mirror during you day to day life, this two-way mirror will allow you to watch your favorite show without the cutter of a TV sitting on your dresser. Available in many different hardwood and finish options, the Amish Vineyard Low Dresser will be the perfect fit to any decor! Please contact one of our furniture specialists with any questions or to assist you with your order. Toll-Free 1 (866) 272-6773. (Item 8899) Amish Vineyard Dresser Low 66"